This little lady is getting some firsts in this family. She was the first one to have stitches and now the first one to have a broken arm (well, a fracture). On Sunday night Pearl was up to her usual, climbing on things and causing a ruckus. She is a climber and I admit that I probably let her climb more than other moms might. So, she was sitting on her children's pretend kitchen while the other kiddos watched a show. She took a tumble and must have just landed wrong on her wrist. That said, a few minutes of crying, a little Tylenol. and we thought she was fine. It took a few days for us to realize that something was broken. It doesn't help that the munchkin was her cheerful self, sleeping better than she has in weeks, and able to play at the park. I am one guilty mama for not realizing sooner that there was a little bump on her wrist was a greenstick fracture. 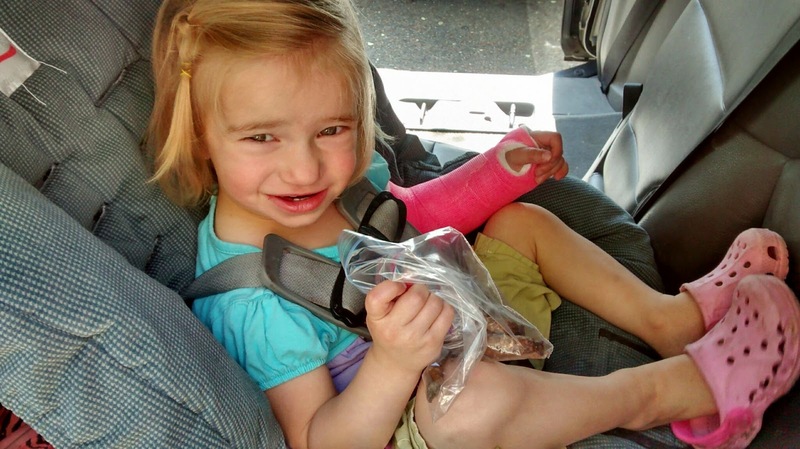 A quick trip to the doctor and a x-ray = a pretty pink cast for our little girl. I was amused that the cast has to go over the elbow, simply because otherwise she would pull the darn thing off. And she would. She has already tried to take if off several time.